The Japanese government conferred a decoration named Order of the Rising Sun on Masahiko “Fighting” Harada, two-time world champion when there were only eight champions on the universe in 1960’s. On the Cultural Day, our national holiday on November 3, Harada received such a great award by the government thanks to his outstanding achievement as a frontrunner in the ring?following the footstep of our very first world titleholder Yoshio Shirai who won the belt in 1952. Harada, at the age of nineteen, dethroned world flyweight kingpin Pone Kingpetch via spectacular eleventh round knockout in 1963, and surprisingly upset previously unbeaten “golden bantam” Eder Jofre to win his second belt in 1965. Harada, in his second defense, repeated his triumph over Jofre next year. 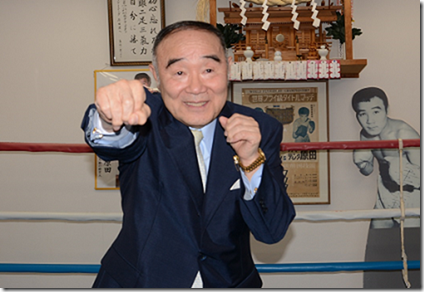 The ex-champion, 73, is still healthy and active, managing his Fighting Harada Gym. Harada says, “I want to produce a world champion like me.” He is truly our fistic symbol. Congratulations.